Mario Karts clone for DOS. Super Worms is a tiny 3D racing game for the PC. 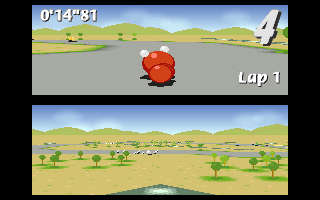 The game can be played by either one player or two players simultaneously (split screen). The objective is to drive your worm around the tracks as fast as you can to win the race, but there are also other ways to win. On each track you will find white balloons. These contain all kinds of items, which you can use to slow down your opponents! A lot more chaos in here than in Mario Kart! This shows the power of short track action. Very smooth and well made game.